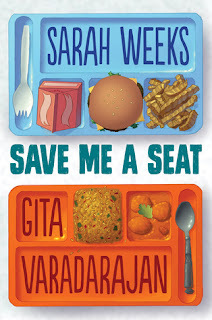 During the school year, I read the book, Save Me a Seat by Sarah Weeks with one of my 3rd grade reading groups. It was a great book about overcoming bullying and being the new kid and self-acceptance and my students absolutely loved it! Plus, it was a total foodie book! 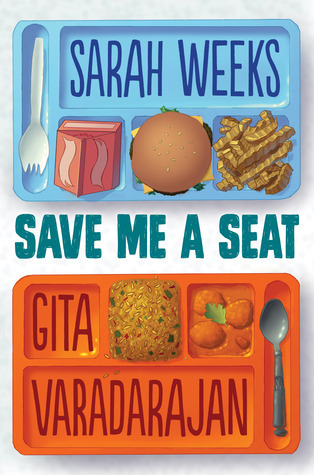 It was split into 5 sections, based on the school lunches, plus there were other mentions of the main characters’ favorite foods, like Huevos Rancheros! I’ve always wanted to make Huevos Rancheros, so I decided to give them a whirl! Then I got distracted while I was researching Huevos Rancheros recipes and decided to make Nacho-style Huevos Rancheros instead! This is officially one of my favorite loaded nachos recipes! 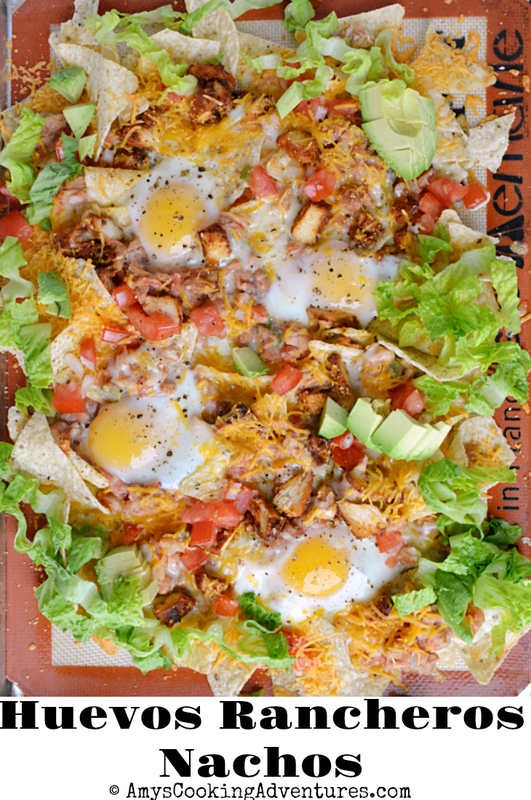 Who knew runny eggs would be such a fantastic addition to nachos? Place the beans (and can juices) in a small saucepan over medium-high heat. Stir in 1 cup pico de gallo and bring to a simmer. Remove from heat and partially mash the beans. Strain out the excess liquid and set aside. Place the chips in a single layer on a large baking sheet. Sprinkle liberally with cheese. Top with the bean mixture and chicken. Sprinkle with the remaining cheese. Make slight wells and crack the eggs into the wells. Sprinkle with the remaining pico de gallo. Add pepper to the eggs, if desired. Bake in the preheated oven for 15 minutes or until the eggs are set. Top with avocado and shredded lettuce and serve. 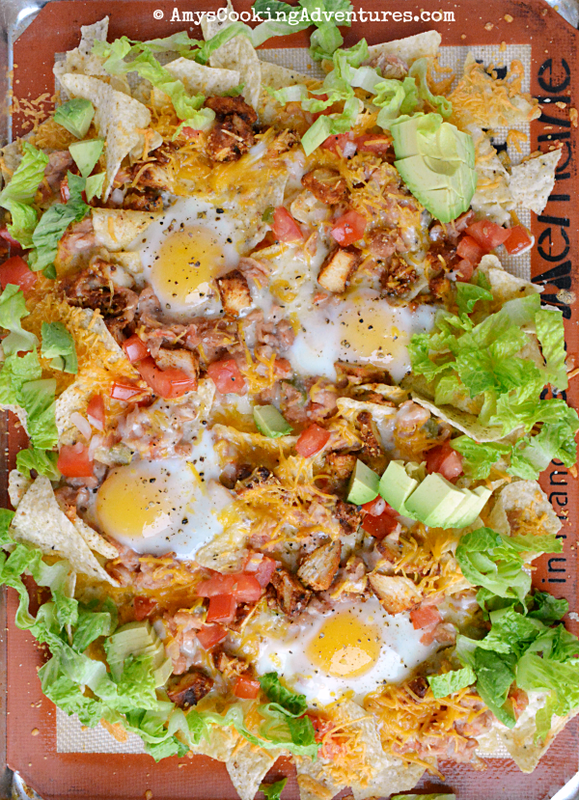 Huevos Rancheros Nachos are a fun twist on a breakfast classic! Preheat the oven to 350 degrees F. Place the beans (and can juices) in a small saucepan over medium-high heat. Stir in 1 cup pico de gallo and bring to a simmer. Remove from heat and partially mash the beans. Strain out the excess liquid and set aside. Place the chips in a single layer on a large baking sheet. Sprinkle liberally with cheese. Top with the bean mixture and chicken. Sprinkle with the remaining cheese. Make slight wells and crack the eggs into the wells. Sprinkle with the remaining pico de gallo. Add pepper to the eggs, if desired. Bake in the preheated oven for 15 minutes or until the eggs are set. Top with avocado and shredded lettuce and serve. Those Nachos do sound totally amazing, and I will be making them pronto! Good book choice for your class too. What a cool sounding book! I bet your class loved the book (and would have dug into these nachos)!!!! You are going to be the most awesome librarian ever! !